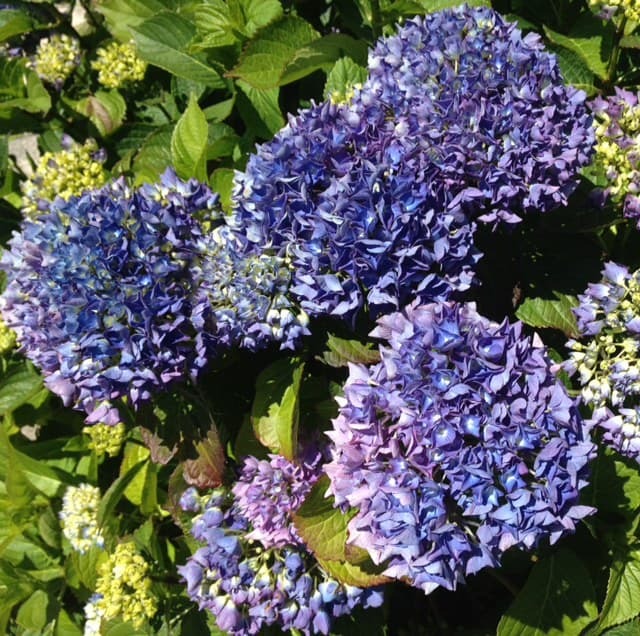 How to change the colour of hydrangeas – Learn how to change hydrangea colour now! One of the most exciting things about hydrangeas is the ability for them to change colour from pink to blue, blue to pink and even to a dramatic mauve/purple colour. Firstly not all hydrangeas can change colour, the only hydrangea that have the ability to change their flower colour as if by magic are the hydrangea macrophylla varieties. These are the large mop head hydrangeas as seen in most gardens and the delicate looking lacecap varieties which all through popular are not seen in as many gardens. It’s common for hydrangeas to change colour after being planted as they adjust to there new environment and soil types. You cannot change the colour of white macrophylla hydrangeas. First, we need to understand why they change colour and what causes it? Hydrangeas change colour because of the type of soil there are growing in, in general, alkaline soils produce pink/mauve flowers and acidic soils produce blue flowers. PH soil testing kits can be purchased from any good garden centre/nursery and will tell you the PH of the soil. A little test you can do to see if your soil is alkaline without a professional tester is to get a small amount of soil from where the hydrangea is (or will be going). A little home test to see if your soil is acidic without a tester! Place the small soil sample in a small cup and pour distilled white vinegar over the soil sample. If the vinegar fizzes then the soil is alkaline. If it does not fizz then the soil is neutral to acid and may produce blue flower and may not need as much work to make flowers blue. To make your flowers blue you need to have acidic soil of ideally around ph 4.5-5. To do this you need to make aluminium present in the soil, the easiest way to achieve this is to use aluminium sulfate which is available from most garden centres and mix 1 tablespoon to one gallon of water. Water regularly through the growing season. to retain the blue colour. You can even get aluminium sulfate tablets which can be mixed with water. It’s important to mention not to add too much as it can burn roots and damage the plant and not to get the aluminium sulfate onto the leaves of plants as it can damage growth and burn the leaves. To reduce the ph of the soil to make it more acidic you can also add organic matter to the soil such a coffee grounds, orange and citrus peeling, grass cutting, eggs shells to name a few. If you have to change the soil too acidic then you will need to repeat the steps above as the soil with a turn more alkaline over time and may need doing yearly. It may be better to grow blue hydrangeas in pots as it easier to control the ph of the soil. If grown in pots then you can plant the hydrangea in ericaceous compost with is acid compost, you can then easily feed with acid feeds to keep the compost acid. Feeds which are labelled as for plants such as azaleas, rhododendron and Pieris are ideal as they are acid feeds. You can also buy bluing compounds from garden centres which contain aluminium sulphate for turning hydrangeas blue and they work very well for potted plants. Pink hydrangeas grow in alkaline soil of ph of around 6 to 6.3, if your ph is any higher then this can cause problems with the hydrangeas having a shortage of iron making them turn yellow. First, check the soil ph level as described above. If your soil is already alkaline then you should be ok, you can enhance the pink and red flowers with ground limestone or chalk at a rate of 75-100g per sqm in winter. To raise the ph of the soil to turn blue hydrangeas pink you can add lime to the soil several times a year and feed with high phosphorous fertilizer and repeat yearly. It may be difficult to change blue hydrangeas pink because you can not remove the aluminium from the soil which turns hydrangeas blue. Another option would be to grow them in large pots where you can easily control the ph of the compost. Using normal shrub compost which contains peat is usually fine for keeping hydrangeas pink.